PURPOSE AND BACKGROUND: Mitochondrial diseases are a group of inherited disorders caused by a derangement of mitochondrial respiration. The clinical manifestations are heterogeneous, and the diagnosis is often based on information acquired from multiple levels of inquiry. MR spectroscopy has previously been shown to help detect an abnormal accumulation of lactate in brain parenchyma and CSF in association with mitochondrial disorders, but the frequency of detection is largely unknown. We sought to examine the frequency of detectable elevations of CNS lactate by proton MR spectroscopy in a population of children and young adults with suspected mitochondrial disease. METHODS: MR spectroscopy data evaluated for the presence or absence of abnormal brain or CSF lactate were compared with other clinical indicators of mitochondrial dysfunction for 29 patients with suspected mitochondrial disease during the years 1990 to 2000. Based on an independent review of the final diagnoses, the patients were divided into groups based on the probability of mitochondrial disorder. RESULTS: A total of 32 scans from 29 patients were reviewed. Of eight patients thought to have a definitive mitochondrial disorder on the basis of genetic, biochemical, or pathologic features, five were found to have abnormal brain or CSF lactate levels revealed by MR spectroscopy (for one patient in whom two images were acquired, one was negative and the other positive). Among the studies conducted using a multisection spectroscopic imaging technique, five of six showed elevated lactate in the brain parenchyma, six of six showed elevated lactate in the CSF, and five of six showed elevated lactate in both brain and CSF. Of 16 patients who were highly suspected of having mitochondrial disorders on the basis of clinical grounds alone but who were lacking genetic, biochemical, or pathologic confirmation, four had abnormal lactate levels shown by MR spectroscopy. Mitochondrial disorder was excluded for five patients, none of whom had CNS lactate shown by MR spectroscopy. CONCLUSION: Detection of CNS lactate by MR spectroscopy is useful in the diagnosis of mitochondrial disease. In our series of patients with confirmed mitochondrial disease, a high level of lactate shown by MR spectroscopy correlated well with other markers of mitochondrial disease. As with all other means used to diagnose mitochondrial disorders, MR spectroscopy does not depict elevated lactate in all cases. Abnormal CNS concentrations of lactate may be undetected by MR spectroscopy because of differences in the type of mitochondrial disorder, timing, severity, or location of the affected tissues and the site of interrogation. Mitochondrial diseases constitute a complex and heterogeneous group of metabolic disorders caused by heritable abnormalities of the respiratory electron transport cascade (1–3). Although mitochondrial dysfunction manifests over a wide range of clinical expression, it most often affects muscle and brain, where dependence on oxidative energy metabolism is highest. Mitochondrial disorders frequently manifest during childhood and early adulthood (3, 4). The most common clinical features are muscle weakness, lactic acidosis, and a broad range of neurologic deficits, but evidence of cardiac, gastrointestinal, renal, or endocrine dysfunction may also be seen (3–5). Common neurologic manifestations include seizures, strokelike episodes, developmental delay, dementia, ataxia, optic neuropathy, retinopathy, sensorineural hearing loss, peripheral neuropathy, and myopathy (3, 6). Recent advances in molecular genetics have added a layer of complexity in our understanding of these disorders. Classification of the mitochondrial disorders remains complex, making a diagnosis challenging. A reference-standard diagnosis is possible when a recognized pathogenic homoplasmic mutation of mitochondrial DNA or abundant levels of a recognized pathogenic heteroplasmic mutation of mitochondrial DNA are shown (7). Even with defined mutations of mitochondrial DNA, the relationship of phenotype to genotype is complex. It is likely that this is partly because of the relative tissue concentration of cells with an abnormal level of mitochondria-bearing mutant DNA. Many patients seem to have characteristics of a mitochondrial disorder without mitochondrial DNA being shown in tissues accessible for genetic analysis. In these patients, the diagnosis of a mitochondrial disorder is necessarily more inferential, based on the constellation of clinical signs and laboratory abnormalities. Considering this complexity, no single algorithm for the diagnosis of the mitochondrial disorders exists; however, in the setting of high clinical suspicion, an impaired redox state shown within the CNS adds substantial weight to the evidence. MR imaging is the mainstay of radiologic evaluation of anatomic derangements of the CNS caused by mitochondrial dysfunction. For many mitochondrial diseases, however, morphologic changes of the brain are nonspecific or are not seen (8–10). MR spectroscopy is capable of detecting the concentration of a number of biochemical metabolites in vivo. In mitochondrial disease, disruption of the respiratory chain and consequent depletion of NAD+ and NADP+ shifts the predominant catabolic metabolism from the Krebs cycle to anaerobic glycolysis. This in turn produces an accumulation of pyruvate and its reduced product, lactate. Elevation of lactate in a localized tissue thus belies a region of oxidative stress, which in turn may reflect either diminished oxygen supply, an increase in metabolic demand that exceeds metabolic oxidative capacity, or a block in oxidative metabolism. In patients who manifest characteristics suggesting disruption of mitochondrial respiration and in whom hypoxia and increased CNS demand for adenosine 5′-triphosphate (eg, as with active seizures) can be excluded, an elevated lactate can be evidence that confirms the presence of a mitochondrial disorder. MR spectroscopy measurement of CSF and brain lactate has been shown to be helpful in the diagnosis and monitoring of mitochondrial disease (11–15), but its practical application to the diagnostic evaluation of a population that is considered to be at risk for mitochondrial dysfunction has not been established. In this study, we retrospectively reviewed MR spectroscopy data for 29 consecutive patients with suspected mitochondrial disease. Spectra were evaluated for the presence or absence of lactate, and each case was correlated with the final diagnosis. We report the frequency of MR spectroscopy-detected abnormality of CSF or brain parenchyma lactate in this cohort of patients with suspected mitochondrial disease and the correlation of elevated lactate to other clinical markers of mitochondrial disease. Patients with clinically suspected diagnosis of mitochondrial disease were referred for MR imaging and MR spectroscopy during 1990–1994 and 1998–2000. The gap of study period reflects the referral pattern, with no patient undergoing spectroscopy between 1994 and 1998. Retrospective chart review for clinical information was approved by the Joint Committee for Clinical Investigation at Johns Hopkins Hospital and was exempted from review by the Internal Review Board. For purposes of data analysis, patients were classified, by a neurologist blinded to the results of the MR spectroscopy, as having definite (group 1), possible (group 2), or unlikely (group 3) mitochondrial disease based on the totality of clinical and laboratory features. Inclusion in group 1 was determined by a combination of clinical suspicion with genetic, biochemical, or pathologic (generally abundant ragged red fibers on muscle biopsy) evidence that strongly supported the diagnosis. Group 2 was defined by the appearance of regional organ dysfunction of a sort associated with known mitochondrial dysfunction that is otherwise not established. Group 3 included those for whom the initial differential diagnosis included mitochondrial dysfunction but for whom subsequent testing established an alternative diagnosis. All MR images were obtained by using a 1.5-T General Electric Signa scanner (General Electric Medical Systems, Milwaukee, WI) equipped with actively shielded field gradient coils. Proton MR spectroscopy studies conducted before 1993 were performed with a long TE single voxel technique by using a point-resolved spectroscopy or simulated-echo acquisition mode (2000/144 or 280/1 [TR/TE/NEX]) sequence with suppression of water signals, using the commercial quadrature head coil (16). In several cases, a short TE (2000/30/1) was used in addition to a long TE single voxel technique. Spectra were recorded from an 8 cm3 volume region of interest was drawn in the affected brain parenchyma. After 1993, most of the MR spectra were obtained by using a multisection spectroscopic imaging technique (17). Spectroscopic imaging was performed by using a multisection (15-mm section thickness) spin-echo sequence (2300/280/1) with outer volume suppression. The field of view was 24 cm, with 32 × 32 phase-encoding steps, rendering a nominal voxel size of 0.8 cm3. Water suppression was accomplished with a single chemical shift selective pulse with a bandwidth of 110 Hz. Extracranial lipid signals were attenuated by the use of eight outer volume saturation pulses. Multisection spectroscopic imaging was performed in a plane parallel to the anterior commissure-posterior commissure line identified from the midsagittal localizer. The four sections were chosen so that the most caudal section was at the level of the third ventricle, slightly above the tentorium; the second section included the lateral ventricles; the third section was at the level of the centrum semiovale; and the top section contained mainly cortical gray matter. MR imaging consisted of a routine brain protocol: sagittal T1-weighted, axial T2-weighted, and axial fluid-attenuated inversion recovery sequences, in addition to axial T1-weighted images recorded for multisection spectroscopic imaging localization. Spectroscopic images of choline, creatine, N-acetylaspartate, and lactate were reconstructed by using 3D Fourier transformation. Before Fourier transformation, a cosine filter was applied in the spatial dimensions; in the time domain, an exponential line broadening of 3 Hz with zero filling to 2048 data points was applied. A high pass convolution filter was used to remove the residual water signal intensity. A frequency correction was also applied to ensure that the chemical shift of N-acetylaspartate was 2.02 ppm in each voxel. Metabolite images were calculated by integration of magnitude peak areas and then by linear interpolation from the original 32 × 32 matrix size to 256 × 256 points. The lactate signal intensity was identified only if a 7-Hz doublet was present exactly at a chemical shift of 1.33 ppm and had to be clearly visible above the noise background. A total of 29 consecutive patients with suspected mitochondrial disease for whom clinical and spectroscopic data were available were included in this retrospective review. The results are summarized in the Table. The mean age of the 19 male and 10 female patients was 14.6 years (range, 6 months to 39 years). The diagnosis of mitochondrial disease was considered definite for eight patients (group 1): mitochondrial myopathy, encephalopathy, lactic acidosis, and strokelike episodes (MELAS), two patients; myoclonus, epilepsy, and ragged red fibers (MERRF), one patient; MELAS/MERRF overlap, one patient; complex I abnormality, one patient; Kearns-Sayre syndrome, one patient 1; Leigh disease, one patient; unclassified, one patient. Mitochondrial disease was considered possible but not established definitively for 16 patients (group 2): suspected Leigh disease, two patients; suspected MELAS syndrome, three patients; undefined, 11 patients. For five patients, the initial suspected diagnosis of mitochondrial disease was undermined by subsequent alternative diagnoses (group 3). The clinical features and the currently identified genetic defects of these syndromes have been extensively reviewed elsewhere (18, 19) and are therefore not discussed here. Brain or CSF lactate was found in nine of 29 patients. Three cases had two MR spectroscopy studies performed. In two, the results were concordant for abnormal lactate levels; in one, only the second study showed elevated lactate. Among the eight group 1 patients, five were found to have abnormal lactate levels (one on a second study). Examples are shown in Figure 1 (patient 5, MELAS), Figures 2 and 3 (patient 18, MELAS/MERRF overlapping syndrome), and Figure 4 (patient 26, complex I mitochondrial disease). For patient 18, the first spectrum obtained in 1998 (Fig 2) failed to show a lactate peak. A retrospective review suggests it may have been obscured by lipid contamination. 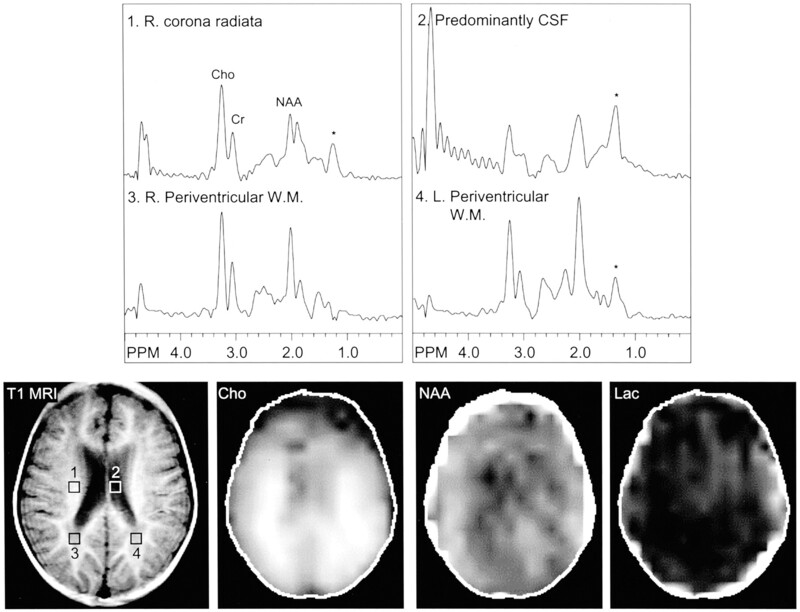 The second spectrum (Fig 3), obtained in 1999, clearly showed elevated lactate in the CSF and periventricular white matter. Images from the case of a 31-year-old man with MELAS syndrome, which was documented by a point mutation in the mitochondrial tRNA (Leu). T2-weighted MR image (T2 MRI) (2600/80/1) shows a large focal hyperintensity in the left parietal region, predominantly affecting the gray matter. This area corresponds to elevated choline (Cho), decreased N-acetylaspartate (NAA), and markedly elevated lactate (Lac) on the multisection spectroscopic imaging metabolic maps. In addition, multisection spectroscopic images show globally elevated lactate, which is greatest in the left parietal strokelike lesion, next highest in the remaining gray matter (G.M.) and CSF, and lowest in the white matter. R., right; L., left. Images from the case of a 3-year-old male patient with MELAS-MERRF overlapping syndrome, which was documented by a point mutation. Initial multisection spectroscopic images show no definitive lactate signal intensity. 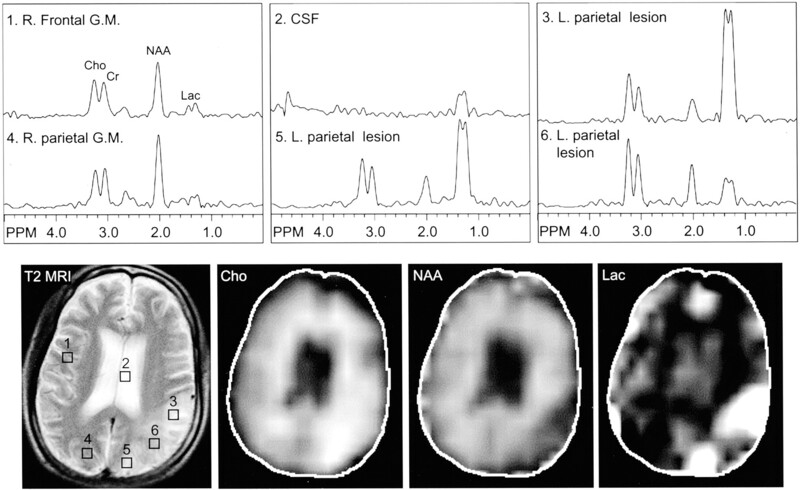 Voxels placed in the right corona radiata (area 1), CSF (area 2), and periventricular white matter (areas 3 and 4) show no clear evidence of lactate doublet. Lipid contamination (*) in this region (1.1–1.4 ppm) may, however, obscure a small lactate peak. R., right; L., left; Cho, choline; Cr, creatine; NAA, N-acetylaspartate; W.M., white matter; T1 MRI, T1-weighted MR image; Lac, lactate. 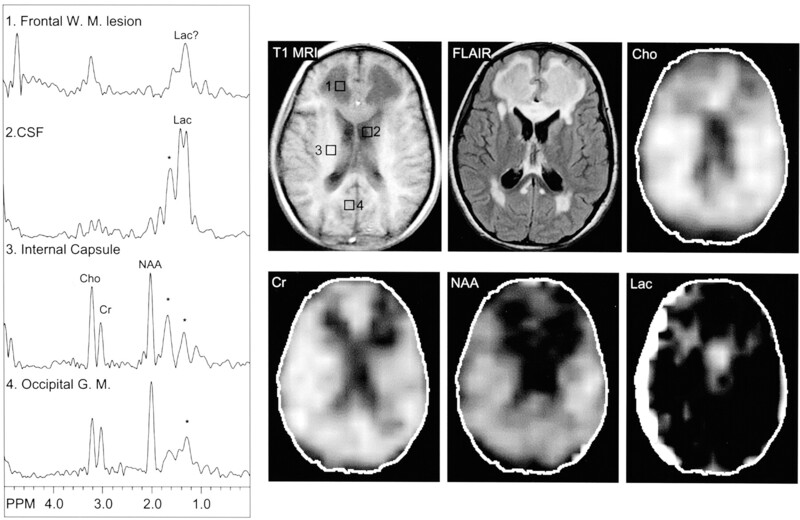 Images from the same case of MELAS-MERRF overlapping syndrome shown Figure 2, obtained 1 year later during a subsequent study. 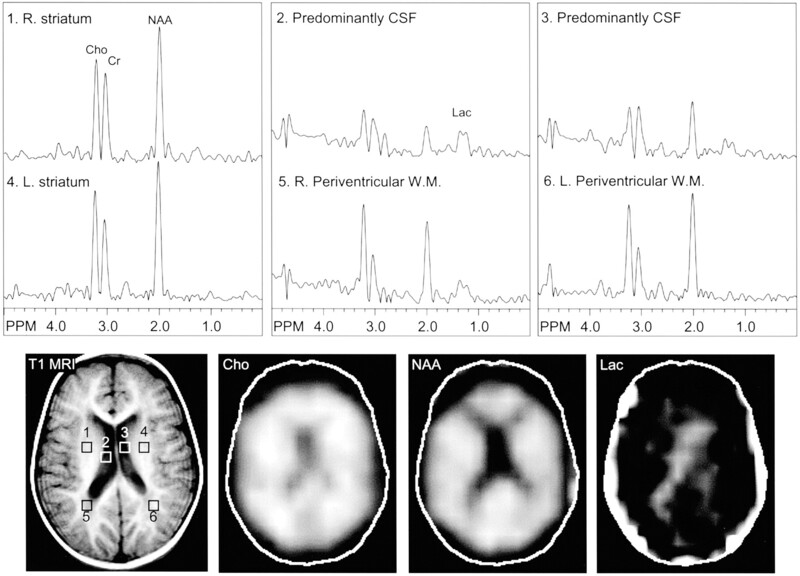 MR spectroscopic images show a lactate doublet in the CSF (lateral ventricles, areas 2 and 3) and periventricular white matter (areas 5 and 6), bilaterally. R., right; L., left; Cho, choline; Cr, creatine; NAA, N-acetylaspartate; W.M., white matter; T1 MRI, T1-weighted MR image; Lac, lactate. Images from the case of an 8-year-old female patient with complex I mitochondrial disease, which was diagnosed when the patient was older than 3 years. MR image shows extensive T1-hypointense and T2-hyperintense signal abnormalities in the periventricular regions, particularly in the frontal white matter, in addition to T2 hyperintensity involving the genu of the corpus callosum. MR spectroscopic images show a large lactate peak in the CSF (left lateral ventricle, area 2). A small lactate peak may occur in the frontal white matter lesion (area 1), although spectra are also partially contaminated by lipids (*).W. M., white matter; Lac, lactate; Cho, choline; Cr, creatine; NAA, N-acetylaspartate; G. M., gray matter; T1 MRI, T1-weighted MR image; FLAIR, fluid-attenuated inversion recovery. Among the 16 group 2 patients with possible but not proved mitochondrial disease, four had abnormal lactate accumulation in the brain or CSF. Among the five group 3 patients thought unlikely to have mitochondrial disease, none had an abnormal lactate level. In previously published studies of control participants (16, 20) that used the same techniques described herein, no lactate was identifiable in any brain region or CSF. MR spectroscopy frequently reveals abnormalities in an at risk cohort, which identifies MR spectroscopy as an important and practical tool in the diagnostic evaluation of mitochondrial disorders. In this study, we found that MR spectroscopy determinations of lactate were highly correlated with other markers of mitochondrial dysfunction that have been used in establishing the diagnosis. In addition, some patients lacking biochemical, genetic, or pathologic confirmation of the diagnosis also have increased MR spectroscopy lactate levels, suggesting that MR spectroscopy may be the sole laboratory marker of the disorder. Several groups have shown that MR spectroscopy is more sensitive than conventional MR imaging in depicting dysfunction in selected symptomatic patients (12–14) and at risk persons without neurologic dysfunction (21, 22). Although the presence of lactate revealed by MR spectroscopy has been used as a signature for mitochondrial disease, the practicality and yield of MR spectroscopy lactate investigation in the diagnostic workup has not been established by investigation of a large cohort of at risk persons. Previous studies have been useful in showing the feasibility of identifying abnormal lactate accumulations in already defined patients. For example, Barkovich et al (8) detected a lactate peak shown by the MR spectra of five of five patients with known mitochondrial disorders (three with Leigh disease and two with MELAS). Castillo et al (12) evaluated eight patients with MELAS syndrome and showed a variety of MR imaging findings, but in five of five cases, MR spectroscopy interrogation revealed a lactate peak. Similarly, Wilichowski et al (14) showed elevated MR spectroscopy lactate in all four patients with MELAS. Matthews et al (15) found a lower rate (50%) of MR spectroscopy lactate abnormalities in 11 patients with various defined mitochondrial encephalomyopathies (including MERRF, Kearns-Sayre syndrome, and MELAS); of 11 patients with 16 investigations, six patients with eight investigations had elevated lactate:creatine ratios >2 SD from the mean. In normal persons, CSF lactate levels are lower than serum levels (11), although dissociation between CSF and serum lactate levels may occur. This dissociation is probably explained by regional differences in the concentration of abnormal mitochondria within a tissue combined with regional variations in the demand for oxidative metabolism. Clinically, serum lactate level is only a fair marker of mitochondrial disease. In their analysis of 36 children with highly suspected mitochondrial disorder (30 in whom the diagnosis of mitochondrial disorder was made), Nissenkorn et al (4) found that few patients had significantly elevated serum lactic acid. Serum lactate concentration was normal in 15 of 36 patients, including three children with Leigh syndrome. With regional mitochondrial dysfunction, blood can be a lactate sink, both diluting the concentration and transporting it to the liver, where additional mitochondrial reserve can re-oxidize lactate to pyruvate. In this setting, MR spectroscopy determination of CNS lactate may be more sensitive than serum lactate in the diagnosis of mitochondrial dysfunction of the brain. In this cohort, MR spectroscopy lactate determination has a sensitivity that is approximately equal to that of the other genetic, biochemical, and pathologic measures of mitochondrial disease combined. A total of nine of 29 patients had abnormal lactate levels shown by MR spectroscopy, whereas eight of 29 were classified as having mitochondrial disease on the basis of conventional criteria. Five of these eight had overlap by conventional and MR spectroscopy criteria. The specificity of MR spectroscopy in the diagnosis of mitochondrial disease cannot be established in the absence of a universally accepted reference-standard diagnosis. However, specificity is likely related to the fastidiousness with which other occult causes of increased lactate can be excluded. Increases in CNS lactate are found in several other pathologic processes, such as hypoxia, ischemia, neoplasm, and abscess or inflammation. In most cases, however, clinical presentation and MR imaging appearance would allow unambiguous distinction among the potential diagnoses. In our series of five cases that were initially suspicious for mitochondrial disorder but tested negative and finally had alternative diagnoses, none had abnormal CNS lactate shown by spectroscopy. As with other measures, MR spectroscopy does not always depict elevated lactate allowing for the diagnosis of mitochondrial abnormality. The lack of lactate abnormalities may reflect insufficient lactate level for detection (MR spectroscopy typically requires >1 mmol/L brain metabolite concentration to be detectable), temporal fluctuations in lactate levels, or failure to interrogate the proper region of interest. Cross et al (23) showed a consistent lactate doublet by using MR spectroscopy for patients with CSF lactate >4.0 mmol/L. In the intermediate range of 3.2 to 4.0 mmol/L in CSF, although abnormal, lactate peak may be below the threshold of detection by this MR spectroscopy technique. Timing of disease apparently is an important factor for lactate detection, because many of the clinical and imaging findings of the mitochondrial diseases manifest in an intermittent fashion. One example is the case of patient 18 with MELAS-MERRF overlapping syndrome documented by chromosomal point mutation. This patinet had negative CSF and brain lactate findings of the original study but abnormal CSF and brain lactate revealed by a subsequent study performed 1 year later (Figs 2 and 3). Similar variability in MR spectroscopy-determined lactate levels, correlating with neurologic deterioration, has been shown by others (23, 24). When the strokelike lesions appear and evolve in patients with MELAS, MR spectroscopy mainly corresponds to focal lesions and may be highly variable. Lactate was often found in acute lesions and sometimes found in subacute lesions but was not found in chronic lesions (14, 15, 24). Failure to interrogate the proper region of interest may be a technical flaw that reduces the sensitivity of MR spectroscopy. Two of the three patients in our series with established mitochondrial disease and normal results of MR spectroscopy were evaluated with single voxel techniques of the brain only, not the CSF. Potentially, this can be a pitfall because we found that patient 19 with Lennox-Gastaut syndrome had lactate detected in the CSF but not in the brain parenchyma, and in patient 26 with complex I mitochondrial disease (Fig 3), lactate level was highest in the CSF. Multisection spectroscopic imaging has the advantage of providing an overview of abnormality via metabolic mapping, providing extended coverage of multiple brain regions and ventricular CSF. In general, the lactate signal intensity is higher in the CSF compared with brain parenchyma (12); some authors have suggested that ventricular CSF would be a simple and sensitive site for screening by spectroscopy (25). The lactate signal intensity may be higher in CSF because of CSF lactate levels being higher than in brain or because of CSF lactate being more readily detectable related to longer T2 relaxation time and narrower line widths in CSF than in brain. Inao et al (26) studied the temporal profile of lactate production and clearance in the brain tissue, CSF, and serum by using an experimental brain injury model induced by fluid percussion trauma in cats. It was found that CSF lactate has a biphasic pattern of elevation after injury, probably initially reflecting the systemic response of trauma and secondarily the slow clearance of lactate produced by brain tissue into the CSF space (26). By this mechanism, there may be a longer window for detection of elevated lactate in the CSF, even if not a larger quantity or concentration, compared with the brain parenchyma. The current study is limited by the intrinsic difficulty of diagnosis in the mitochondrial diseases. Phenotypic presentation is variable and diverse, and in established cases, each of the various tests has less than perfect sensitivity. We found that abnormal MR spectroscopy lactate levels identify 63% of patients with diagnosis established by other conventional means. Thus, MR spectroscopy is a useful confirmatory test. Beyond this use as a confirmatory test, however, when other causes of elevated CNS lactate can be excluded, MR spectroscopy evaluation may provide strong evidence for the diagnosis of mitochondrial disease even in the absence of other definitive genetic, pathologic, or biochemical abnormalities. Abnormal positive lactate peak is frequently detected by proton MR spectroscopy in patients with established mitochondrial disease. The presence of CNS lactate correlates highly with other clinical markers for mitochondrial disease in a larger cohort of 29 patients. The presence of lactate revealed by proton MR spectroscopy may vary with the type of mitochondrial disorder and regional and temporal variation of disease involvement corresponding to the natural heterogeneity of mitochondrial disease. We conclude that multisection spectroscopic imaging is a useful study in the evaluation of mitochondrial disorder, the diagnosis of which remains challenging and is perhaps best approached by multidisciplinary modalities. Supported in part by NIH P41 RR15241. Accepted after revision July 25, 2002.